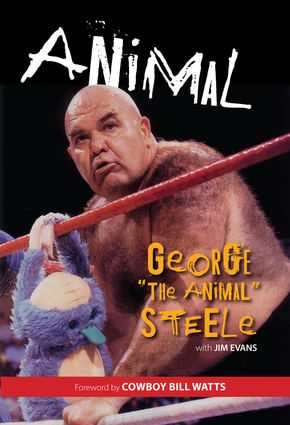 George “The Animal” Steele is Jim Myers, a retired professional wrestler, high school teacher, and high school football and wrestling coach. He is an inductee of the Professional Wrestlers Hall of Fame, the World Wrestling Entertainment Hall of Fame, and the Michigan High School Coaches Association Hall of Fame as well as the Michigan High School Football Association Coaches Hall of Fame. He lives in Cocoa Beach, Florida. Jim Evans is a sportswriter and columnist for the Daily Tribune of Oakland County, Michigan and Macomb Daily. He lives in Rochester Hills, Michigan. Cowboy Bill Watts is a former professional wrestler and promoter who worked with and developed some of the biggest names in wrestling history. He is the author of The Cowboy and the Cross. He lives in Bixby, Oklahoma.